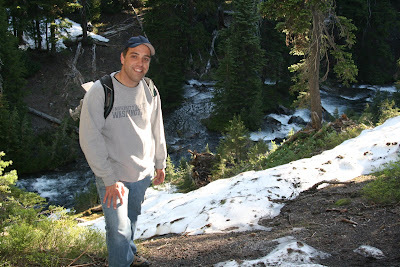 Krista and I went hiking up near Sunriver last week. It was the Three Creeks trail, headed up to the Green Lakes. It was a spectacular hike... I'm sure Krista will put up more pictures later this week. Here's a moment early in the hike. Krista (with her camera): Take another step backward. Me (looking at the drop to the river below): Is this the part where you try to murder your husband? Me: Just remember, I have the car keys. Krista: I have car keys, too. Bbbwwahahahahahaha. Krista's good. Too good.